I guess QE did work. With interest rates at near zero, Act 1 of QE was to shift investor preference up the liquidity curve into higher yielding and riskier assets. We did get asset reflation in equities, bonds and real estate. The problem was, the wealthy have a lower inclination to spend and would rather store their gains. Corporates preferred the liquidity for share buybacks. And households were de-leveraging post-GFC and in no mood to consume. So despite the surge in liquidity, the use (or velocity) of money globally was at record lows. It took the real economy several years to heal through wealth effect and lower cost of capital. Act 2 has finally arrived. It is the transmission of this liquidity to stimulate aggregate demand. Global economies are back to a growth mode not seen in five years, according to IMF. To keep this recovery on a self-sustaining path, we need a positive feedback loop of higher sales that spur further employment and capital investment. This then feeds into higher aggregate demand and sales. As corporate profits recover, peppered with the usual dash of executive optimism, we have finally seen a revival in investments. Employment has recovered to multi-year highs but lacking has been wage growth. It has been creeping up but not robust. Higher wages is critical. Money can then be placed in the hands of those with a higher propensity to spend and more liquidity will flow into the real economy. In summary, we expect the rally in global growth to continue in 2018. Wage growth will be the final cog to sustain an above-trend growth, even in the face of rising interest rate. Strategy: Under such a macro scenario that we construct our playbook for 2018. The sector we favour the most is banks. Banks will be surfing the wave of rising interest rates, recovery in asset quality and higher loan volumes. The concoction could not get any better. Property stocks we believe can perform until at least the 1H18. We still view them as a trade because of high vacancy rates, stretched affordability and fluid demand. We fear these could be roadblocks to any secular story. Our other Overweight is consumer. With wage growth improving (personal wish too), consumers in Singapore should open up their wallets again. This is our laggard Overweight as data has not revealed itself yet. STI Target: We raise our STI target from 3450 to 3900. This a bottoms-up target, based on a culmination consensus and our target prices. At 3900, PE for STI will be around 17x. Recommendation: In our absolute return portfolio for 2018, our top 10 picks are: a) Asian PayTV and Ascendas REIT, for those with an appetite for only dividend yield; b) Chip Eng Seng, Dairy Farm, DBS Group, Geo Energy and Micro-Mechanics, for earnings growth; c) ComfortDelGro, Banyan Tree and CapitaLand are our re-rating plays. 2017 kicked off with exuberance over the Trump reflation trade, matched by angst over the EU’s with looming elections and the populist wave. The Trump reflation trade was a head fake. US Treasury yields and US dollar reversed their ascent, and any planned infrastructure stimulus fizzled out. Macron’s overwhelming parliament majority in France ended the debate on EU disintegration. Instead, it rekindled hopes of some fiscal union in the future. Over in Singapore, the outlook was tepid, at best. Consensus expectations for GDP in 2017 was a sombre 1% – 2%. This was warranted as most indicators were languishing. Loans growth were only growing at 1%, consistent with industrial production paltry 1% climb. And exports moving sideways. However, as the year progress, it became more evident an economic recovery underway, trending far better than expected. Global economic growth breached several years’ high, accompanied by low inflation. Such conditions ignited the performance of cyclicals, in particular electronics. Another notable event in Singapore was the relaxation of property measures in March. Initial market response was lukewarm, but as the months ploughed on, pent-up demand started to fuel primary and secondary private residential sales. Sales surged to four-year highs and averaging 2300 units per month, up 36% from a year ago. The cyclical uplift for Singapore is well and underway. We are enjoying the best growth rates in five years. For investors, the crucial question is the longevity of this expansion. We used several indicators to give us a peek into the near-term. Singapore new orders PMI suggest economic vibrancy at least till 1Q18 (Figure 1). Another gauge, IFO business expectations, similarly points to sustainable strength in 1Q18 (Figure 2). Sustainability, we think, would require a positive feedback loop. Rising sales need to be followed up with employment or wage growth and further capital investment. This will keep an economy on a self-sustaining path. Therefore, two sources of demand need to be trending upwards in 2018, namely wages and capital spending. Capital investment has started its recovery. Employment is at a multi-year high. Only wage growth has been below trend. Capital Investment: Going by the US proxy, global investment cycle recovered early this year, after drifting for almost three years. We see this in both nominal private fixed investments (Figure 3) and spending on durable goods (Figure 4). Wages: Wage growth has been sanguine in most parts of the world. As Figure 5 illustrates, US wage growth after GFC has been stuck in a 2% to 2.9% range the past eight years. Singapore’s has averaged 3% p.a. for the past three years. It historically lags GDP by three quarters (Figure 6). We are upbeat, holding the view that wage growth will recover, albeit after a longer lag. We feel there are two secular reasons for the longer lag in wages, notably (i) the build-up of automation in both manufacturing and services sector; (ii) expansion of the global pool of labour with the opening of several developing countries to globalization. In summary, we expect a continuation of the global growth in 2018. Forward indicators point to at least a healthy 1Q18. For growth to be sustainable, we would need investments and wage improvements. So far, only capital investment has recovered. We believe wage growth will return after a lag. This can bolster growth, even in the face of rising interest rates. In Singapore, our Overweights are in Commodities (Coal), Consumer, Finance, Industrial (Electronics) and Property. All these sectors are riding on a healthy sales moment. Only consumer is less apparent as any improvement will be lagging. Asian PayTV and Ascendas REIT: These are not cyclical bets but they provide attractive dividend yields with healthy capital appreciation. 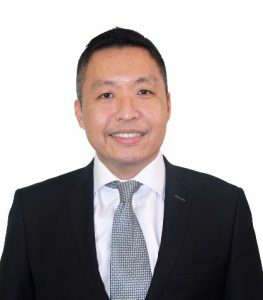 Chip Eng Seng, Dairy Farm, DBS Group, GEO Energy and Micro-Mechanics: These are stocks that will register earnings growth at attractive valuations. Banyan Tree, CapitaLand and ComfortDelGro: We believe these companies will benefit from a market re-rating in 2018. STI target. Our STI target for end 2018 is 3900, an upside of 14%. This a bottoms-up target, based on consensus and our target prices. At 3900, PE for STI will be around 17x. 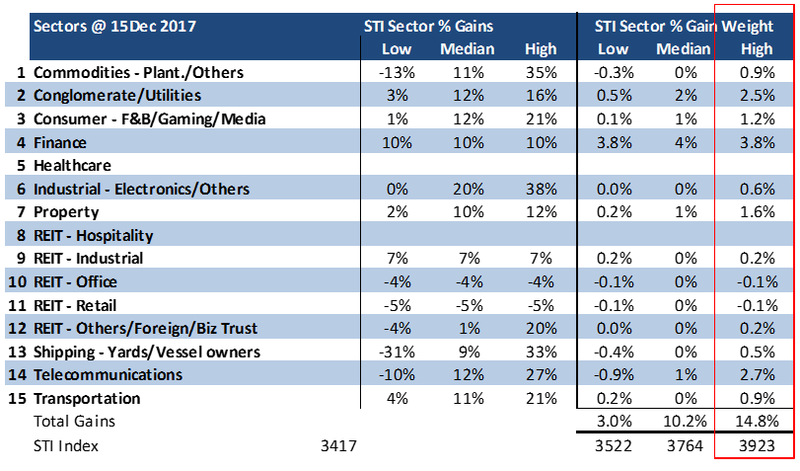 As Figure 9 illustrates, the largest index contributors to STI in 2018 will be finance, telecommunications, conglomerates, and property. In terms of percentage upside, the largest comes from industrial (+38%), commodities (+35%) and shipping (+33%). REITs’ performance is expected to be mixed. Commodities – Coal: High production, the best in the region, gives us confidence of strong earnings growth even when we assume coal prices will moderate in 2018. Paying dividends will give investors confidence but some have a habit of using excess cash for non-core reasons. Conglomerate/Utilities: Apart from water utilities in China, this sector will be challenged especially in a rising interest rate environment and every country seem to have their own unique challenge. Singapore faces huge excess power with reserve margin of 90%. Consumer: Probably our least consensus recommendation as we are betting on a turnaround in consumer spending. More evident signs of consumer spending likely in 2H18. Finance: A genie could not have granted Singapore banks as many wishes. The 5 wishes are rising margins as interest rates improve, better asset quality, loan volumes rebound, possible special dividend and new revenue stream from wealth management. Healthcare: Facing headwind of weaker patient load as foreigners move to perhaps Malaysia and new public hospitals take market share. A further problem could be “fee guidance” from the authorities. Industrial: Electronic stocks was the best performer in 2017. Rightly so, some of the companies have not seen such earnings growth since dot-com days. Latest data points suggest there is still legs to this rally. Anyway, the recovery is not just cyclical reasons. Successful companies have transitioned away from PC era to autos, medical and IOT. Property: Market will focus on headline take-up rates of new launches next year. This will give another rally in the stocks. However, not much comfort how sustainable this bounce as we face demographics, affordability and vacancy wall. 8-12: REITs: More selective and we prefer sectors that have favourable demand-supply conditions (hospitality, office) or favourable tenancy and leverage features (long WALE, low gearing). This can help these REITs cope with rising interest rates. Shipping – Yard: Potential trading opportunity by navigating from one news cycle to another. We are still nervous over the fundamentals of this sector. Telecommunications: We have no coverage but any announcement of price plans in middle 2018 could be the bottom of this sector. Arrival of 4th telco has been well flagged and incumbents have already responded by lowering prices and sacrificing margins. Transportation: We view ComfortDelgro as a BUY. We think the bus and rail sectors can hold earnings and keep overall fundamental intact despite the onslaught of ride-sharing services. the report mentions OVERWEIGHT on commodities sector, but it seems there are no stocks in the Absolute 10 portfolio which is representative of this sector. Is it possible to give some stocks or ETFs which Philips analysts cover? how about the market outlook about US?